A ton of Murano glass. 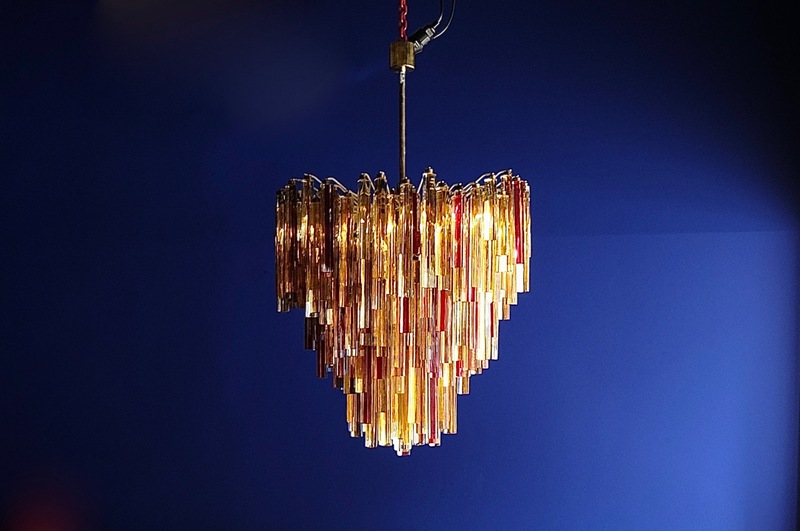 Pure Glam: Glass chandeliers fit for a hotel, a casino, a cinema – or your private dining room. This is one of a total of 4 identical chandeliers available, currently displayed in our showroom (the 3 others are sleeping in our warehouse). These 4 chandeliers we found years ago in Italy, dismantled, packed in many boxes, which were already in dissolution. Total weight of all 4 chandeliers: approx. 1 ton. Each chandelier consists of a round steel skeleton with a 4-storey light bulb wreath inside, each light bulb wreath has its own power connection, so you can switch on 4 different light levels (functioning as a dimmer). Each of the glass prisms of different lengths has a brass cuff that serves as a suspension in the skeleton. Glass prisms are all mouth-blown, in the middle there is either a red or yellow round glass rod, encased in clear glass. At the moment we are in contact with the traditional italian glass producing company Venini in Murano, Venecia. They are searching their archives of 75,000 documented pieces (which have been available since 1921) to try and find out exactly when and for whom these 4 chandeliers were made. For the moment being we enjoy this most luxurious lighting object we ever came across.